Warnings: Allergen Statement; This product contains ingredients derived from milk and soy. This product is manufactured in a plant the process milk, soy wheat and eggs. Recommended Use: Mix tow scoops in 10 fl. Oz. of water. Tastes like a real milk shake. Before and during Workouts. 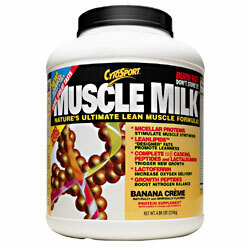 Take Muscle Milk on hour prior to workout. For a truly awesome workout, take Fast Twitch Power Workout Drink Mix before and during your workout. After Workouts. Take Muscle Milk within one hour of completing your workout. After workouts, the body is in a catabolic state. Muscle Milk helps reverse this muscle synthesis. Prior To Bedtime. Sleep is actually a catabolic period, Remember, breakfast means to break you fast. During any fast, you break down previous muscle tissue for energy. Muscle Milk will help yon wake up more anabolic.